. When fast solar-wind streams, emanating from coronal holes, interact with slow streams, they can produce Co-rotating Interaction Regions in interplanetary space. 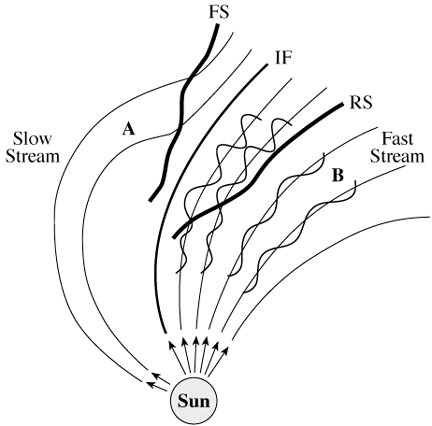 The magnetic fields of the slow streams in the solar wind are more curved due to the lower speeds, and the fields of the fast streams are more radial because of their higher speeds. Intense magnetic fields can be produced at the interface (IF) between the fast and slow streams in the solar wind. The Co-rotating Interaction Regions are bounded by a forward shock (FS) and a reverse shock (RS).